The Alps cover 65% of the Swiss territory, making Switzerland the second most Alpine country (after Austria, where the proportion reaches approx. 68%). Because of their central position within the entire Alpine range, they are also known as the "Central Alps". Setting aside that part of Graubunden which lies to the east of the Hinterrhein Valley - a high valley like the Engadin, which with its extra-continental climate, is more typical of central Europe - the Swiss Alps, like the French ones, belong to the western Alpine group, that is, to the steepest and most contorted chain. Despite the fact that Switzerland covers only 14% of the Alps total area, 48 of 82 Alpine four-thousanders are located in the Swiss Alps and the remaining few are within 20 km of the country's border. 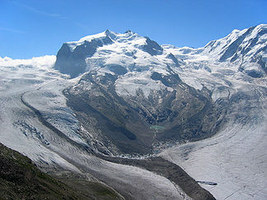 The glaciers of the Swiss Alps cover approx. 3% of the Swiss territory, representing 44% of the total glaciated area in the Alps. The culminating point of this world of lakes and glaciers is the Monte Rosa in the Valais with an altitude of 4,634 m (15,202 ft) at the Dufour Peak. The Sankt Gotthard Massif (mountain range), which could be called the water tower of Europe, represents the keystone of the whole structure in spite of its monotonous outlines. The lack of symmetry of its transverse section has been the most striking feature of the mountain chain, since the sinking of the Po Plain closed its eventful geological history. 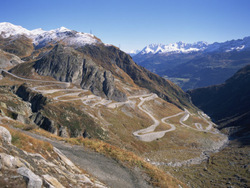 A motorist crossing a pass like the Sankt Gotthard is made aware of the sharp contrast between the relatively gentle slopes of the north face and the sudden descent which occurs on the south. In the longitudial direction, the remarkable depression which slashes through the mountains from Martigny to Chur and is drained in opposite directions by the Rhone and the Vorderrhein, forms a great strategic and tourist highway. Tourism in the Swiss Alps began with the first ascents of the main peaks of the Alps (Jungfrau in 1811, Piz Bernina in 1850, Monte Rosa in 1855, Matterhorn in 1856, Dom in 1858, Weisshorn in 1861) mostly by British mountain climbers accompanied by local guides. The construction of facilities for tourists started in the mid 19th century with the building of hotels and mountain huts, and the opening of mountain train lines such as Mt. Rigi (in 1873) and Mt. Pilatus (in 1889) in Central Switzerland, the Gornergrat (in 1898) above Zermatt in the Valais, and the Jungfraujoch (in 1912) in the Bernese Oberland, which is located at 3,454 m (11,330 ft) above sea level and is the highest railway station in Europe. In addition, several scenic trains connect the major destinations in the Swiss Alps, and thus, the best way of seeing the Swiss Alps is getting on the Glacier Express (Zermatt - Andermatt - Chur - Davos and St. Moritz), or on the Golden Pass (Montreux- Gstaad - Interlaken - Lucerne).